Conservative Party candidate Stewart Jackson won a third term as MP for Peterborough before declaring rumours of his political death had been ‘greatly exaggerated’. Amidst loud booing as the results were announced, Mr Jackson hit out at Labour who came second despite candidate Lisa Forbes increasing the party’s vote from 13,272 to 16,759. Mr Jackson, who declared this was his ‘sweetest win’ as an MP candidate, retained his seat despite seeing his majority reduced from 4,861 five years ago to 1,925 with UKIP pushing the Liberal Democrats into fourth place. The Lib Dem vote was sharply reduced from 8,816 in 2010 to 1,774 this time around, while the Greens came in fifth with 1,218 votes. A poll last week from former Conservative deputy chairman Lord Ashcroft had put Ms Forbes two points clear, a point referenced by Mr Jackson in his victory speech. Tory Stewart Jackson and wife Sarah celebrate with supporters after winning the Peterborough seat. In an interview which followed his victory speech, Mr Jackson added: “It’s an emotional thing to have to apply for your job every five years. “I had no plans [in case I lost] but I had obviously considered I might lose as the Labour Party made a big push to win the seat. “Peterborough is a marginal seat and to be able to win it for a third time after going through the rollercoaster of the last five years, I’m absolutely delighted of course. “As MP I’m going to see if I can help the city council improve education. I’m committed to good housing and good public servicing. Asked if this was best victory as an MP candidate, Mr Jackson replied: “Yes. This is the sweetest, not least because I was written off. “[The Ashcroft poll] felt like a kick in the solar plexes to be honest because I wasn’t expecting it. “I always had the inkling Lord Ashcroft might poll Peterborough, but I thought that I would be even-stevens or slightly ahead as the incumbent MP. Ms Forbes defended her party from comments made by Mr Jackson about the influence of union funding in her campaign. She added: “A lot of people in Peterborough are really struggling out there and Stewart needs to recognise that. He needs to recognise people are struggling to put food on their table and put gas and electric in their meters. On her own performance as an election candidate, Ms Forbes said: “I tried my best as a candidate. I’ve increased our vote share. “It’s really difficult for the Labour Party when you’ve got all of the media against you. “The sort of campaigns that the Tories have run is basically scaring the public into thinking that if we get a Labour government it will be chaos which is absolutely untrue. 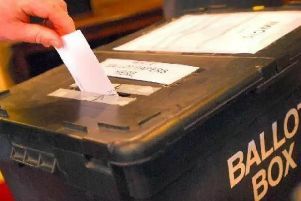 UKIP candidate Mary Herdman believed she might have been a victim of tactical voting. Liberal Democrat candidate Darren Fower said: “I’m disappointed simply because I didn’t win. But our campaign team did exceptionally well. Peterborough had been a target seat for Labour with the party sending high-profile politicians such as Yvette Cooper, Ed Balls and John Prescott to the city before and during the campaign. Mr Jackson won the seat in 2005 off Labour’s Helen Clark before defeating Ed Murphy in 2010. He will now be sworn into parliament when it returns on Monday, May 18. More: Re-elected MP Stewart Jackson in controversial victory speech. Conservative Party hold North West Cambridgeshire seat.